When Does My Cat Become A Senior? At 24 human years old, a cat is now considered geriatric. While some veterinarians use the terms senior and geriatric interchangeably, strictly they are different as shown above. Also, a senior cat is one that is in a relatively good physical condition despite signs of age-related changes. 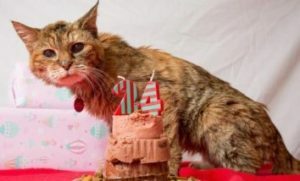 A geriatric cat is one that is in a fragile condition and show adverse signs of illness and need a higher level of special care than a senior cat. Age-related changes in senior cats may include: irregular bowel movement and urination, hypertension, poor circulation, arthritis, worn down teeth, unkempt hair coat, decreased resistance to diseases and even cognitive dysfunction. They are part of the natural process of ageing. They are mostly irreversible but when detected early, proper management can be instituted and their progression can be slowed. This will significantly contribute to improving senior kitty’s quality of life. Therefore, it is an advantage when cat owners are observant and are regular in taking their cat to the veterinarian for check-ups. Age related changes in older cats include arthritis. 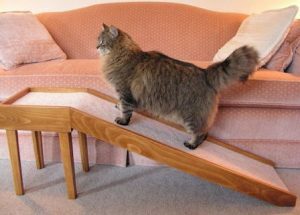 A ramp will help senior cats get on their favorite couch. In this light, it is important to never assume that all changes in a senior cat’s behavior or physical condition are all of the time due to old age. It is best to have senior kitty checked by the veterinarian at the first sign of a problem. Water is essential for life. Cats of any age need to drink a minimum of 60ml water for every kilogram of their body weight per day for the cells and organs to function properly. Meeting this requirement is even more important in senior cats because they are more prone to suffer the effects of dehydration. Outlined below is how dehydration can contribute to the more rapid development of the age-related changes seen in senior felines. Dehydration can also complicate pre-existing disease conditions. Poor Blood Circulation – Blood is mostly made up of water. When a cat is dehydrated, blood becomes thicker and consequently flow becomes slower. This compromises the transport of oxygen and nutrients to the different parts of the body. It also results to decreased waste elimination. Altered bowel movement and urination – Water is needed for the breakdown and absorption of food from the gut. Moisture also helps keep feces soft for easy elimination. Dehydration leads to poor digestion and constipation. Dehydration also signals the kidney to start conserving body water resulting to decreased amount of urine formed. Arthritis – Water is required for the proper lubrication of the joints. When a senior cat is dehydrated it can significantly contribute to painful joints making the cat less mobile. The synovial liquid lubricating the joints is mainly water. Dehydration contributes to decrease in synovial fluid causing painful joints. Electrolyte (salts) imbalance – When a cat is dehydrated there will be an imbalance in the different salts in the blood which are called electrolytes. These salts play a role in carrying electrical signals between cells. In an imbalance, there will be involuntary movement, seizures and loss of consciousness. Prolonged dehydration may impair cognitive function in the long term. Impaired Kidney Function and Kidney Failure. Water is necessary for the proper excretion of body waste products. In dehydration, body conserves water and the cat urinates less frequently causing waste and toxins to remain in the blood. This burdens the kidneys and increases the likelihood of kidney stone formation which in turn increase the risk for chronic kidney disease. Chronic Kidney Disease (CKD) is a common condition in senior cats. It is the condition wherein there is persistent loss of kidney function over time. Most of the time there is no specific cause of CKD but it is suspected that injury is due to contributing factors like low grade exposure over time to bacterial infection, toxins and improper diet. 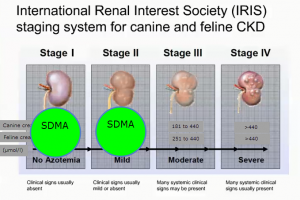 Diagram of the four stages of Chronic Kidney Disease and the appearance of the kidneys at each stage. When the kidneys are not functioning properly waste products remain in the body longer creating a loop that causes further damage to the kidneys. Hypertension or elevated blood pressure is one consequence of CKD that is commonly seen in older cats. Hypertension in turn affects other systems resulting to a multitude of signs like difficulty breathing, blindness and seizures. Other complications of CKD include anemia and heart failure. If left unmanaged, chronic kidney disease can lead to kidney failure then signs of frequent urination and excessive thirst and drinking become apparent. There is no cure for CKD and “treatment” is geared towards managing the condition. This entails minimizing the build-up of the toxic waste products in the blood, correcting electrolyte imbalance, controlling blood pressure and ensuring senior cat has proper nutrition. CKD can be managed effectively with good hydration. It promotes urination which will flush out the toxins and reduce the stress on the kidneys. Diuresis also decreases the chances of the cat developing lower urinary tract infections which may complicate CKD. 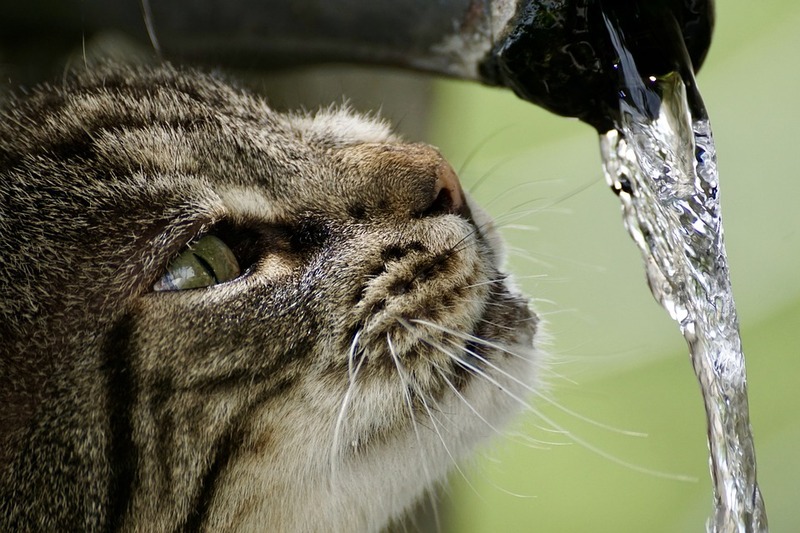 Adequate hydration slows down the progression of CKD and prolongs the life of senior cats. Water intake can be increased indirectly by offering wet food. Feeding smaller portions more frequently may also encourage more drinking as cats usually drink after a meal. Make drinking water sources easily accessible to senior cats, keeping in mind that they may already have joint and mobility problems. Invest in a good quality water fountain that will provide senior cat fresh oxygenated moving water all day making the water more palatable and encouraging them to drink more. 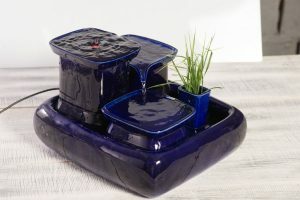 This cat water fountain with 3 water pools from Miaustore is beneficial for older cats with mobility problems because it will be easy for them to drink water from the uppermost pool without having to bend low. Geriatric cats may need to have regular intravenous (directly into the blood vessels) or subcutaneous (under the skin) fluid administration at the veterinarian’s office to maintain adequate hydration.